This article is from the Spring 1999 AFRMA Rat & Mouse Tales news-magazine. Cost of White Mice, etc. QHow much do WHITE mice cost, what do they eat, how long until they are fully grown? AWhite mice can cost anywhere from 99 cents to $2.49, depending on where you live. White English show mice usually cost $5–$10. Color has nothing to do with their price. Generally, the Pink-Eyed White English show mouse is the typiest, best looking mouse on the show table. As far as finding a market for your mice, you might try the local pet shops in your area. Pet stores generally get their stock from large commercial breeders though, so don’t get your hopes too high about selling your extras. They eat lab blocks as the main diet; rat and mouse seeds, dry bread, some fruits and vegetables, “healthy” cereals like shredded wheat, Cheerios, etc., and birdseed as treats. They will be close to full size around 6 months of age. 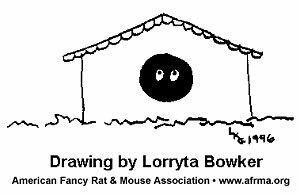 On our home page we have lots of information on mice, rats, and AFRMA. We even have our Standards with photos of the different types and colors of mice and rats, a pet registry form to print out, and application to join the club, among other things. QWould you know how I might find good homes for some of my mice. I can no longer care for all the mice like I used to, and it’s not fair for them to be so neglected. AFinding good homes for mice can be a difficult and daunting task. You could ask your local pet stores if you could set up a cage and sell them only as pets on consignment. You could also contact the schools in your area to see if any of the teachers would be interested in classroom pets. Put notices up at animal supply stores, pet stores, and veterinary offices offering your mice to good homes only. You might try advertising in the classifieds of your local paper. Also, some shops have bulletin boards where people can advertise animals for sale or looking for homes. Is it only that you do not have time to play with your animals? As long as they have cagemates and/or wheels and other toys, mice are pretty self sufficient. We have a tendency to “humanize” our rodent friends with the thought that they NEED our attention when in actuality they are probably happier to be left alone. If you are not able to feed or clean your mice properly, then you should consider sending them to the pet store and hope for the best. An animal should always have a good life, no matter what the length.